Sea of Shadows (originally published and reviewed as Torpedo) is one of those novels that grabs you quick and doesn’t let you go until the final page. 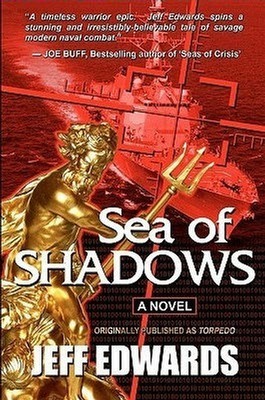 Retired Chief Sonar Technician Jeff Edwards takes the reader inside the day to day operations of a high tech destroyer, part of a small group hunting a quartet of deadly, state-of-the-art German submarines en route to a tyrannical Middle Eastern dictator’s navy, in violation of an embargo. But this is more than just a hunt down and stop mission. The Luftwaffe has already sunk one British destroyer and damaged another to get the sub through the Straits of Gibraltar, and the subs have taken on an American carrier battle group in the Med, shooting down two anti-submarine helicopters and damaging a third. Now only U.S.S. Towers and her small group of destroyers and frigates stands between the subs and their destination—if the subs don’t get them first. The stakes are incredibly high. A bio-war attack has killed most of the British embassy staff in Washington, and if the German subs reach their destination war is almost sure to follow. Trained in NATO tactics, the Germans have a clear advantage, for they are able to anticipate every move of the forces arrayed against them. From the White House to the Arabian Gulf, the action and suspense never lets up, with the future of the world in the balance.